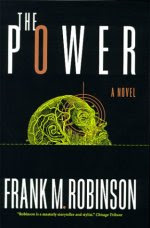 Another book I finished recently was Robinson's The Power. It's an oldie that I hadn't known about until recently, but it came to me highly recommended. It was quite entertaining, and I'd recommend it, especially if you're in the mood for a fairly short, fairly fast-moving page-turner. Without spoiling the story for anyone who hasn't read it yet, the main idea is that there is a man afoot who is endowed with extraordinary abilities (the titular "Power"). This fact comes to the attention of Professor Tanner who is in short order plunged into a nightmarish quest to figure out and stop whomever it is among his research group that is actually the deadly Adam Hart, moving in disguise, and presumably plotting to take over the world from common homo sapiens. The plot makes clever twists and turns right up to end of the last page. One gripe that I would have about this particular edition that I read is that it is a revision. Robinson evidently did an "update" of it sometime during the 1990s. This is clear from references to the US losing the Vietnam War and to veterans of the Gulf War, events that had not yet occurred when this was written in the early 1950s. Having never read the original version, I do not know how exactly it compares, but it's clear that this is a very thin 1990s veneer laid over a 1950s novel. If you were to suspend disbelief and grant that the story takes place in the 90s, then it's riddled with anachronisms: people addressing each other as "mac" and saying things like "what's the big idea! "; casual pipe-smoking in homes and offices; women generally having no role in the affairs of men and commerce; the lack of computers and mobile phones, and so on. I bet the original without the updates would have been better. It could be taken more easily as what it is, a 1950s novel. 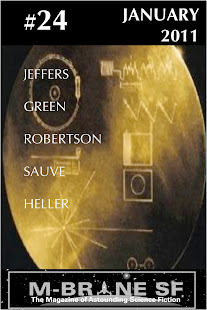 By the way, people are making some great reading recommendations with yesterday's post. Feel free to keep that up.